Pontianak, Kalimantan is one of the weekend getaway destinations in Borneo. It is the capital of West Kalimantan, the western half of the Indonesian portion in the island of Borneo. Although it is not a modern city compared to Balikpapan in East Kalimantan, it has its own unique traits to attract tourists. This capital is called Pontianak, which means ghost in Malay and it used to be a nest for the ghosts until the former sultan arrived to expel them away to build this city. One of the famous iconic tourist spots in Pontianak is the Equator Monument or also known as Tugu Khatulistiwa where the equator line divides the earth into the northern and the southern part. You can stand over the equator line to have one of your foot in the earth’s northern hemisphere and another foot on the earth’s southern hemisphere. It is super easy to experience that for yourself. Getting to Pontianak, Kalimantan is very easy. 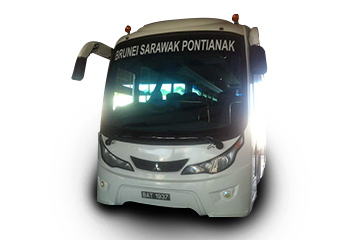 You can travel from Bandar Seri Begawan, Brunei to Pontianak, Kalimantan conveniently by bus. 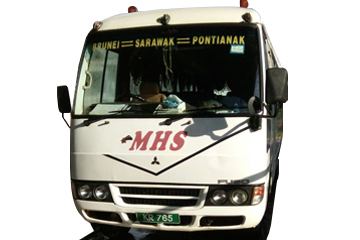 MHS Express Bus Company is one of the famous cross-border transport service providers that offer bus services to the local in Borneo and also tourists. You can get MHS Express bus ticket now at Easybook by following a few easy steps using our booking guide. 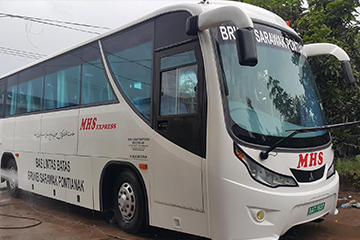 MHS Express bus company was established in the year 2000 to provide good bus services to the locals and tourists. 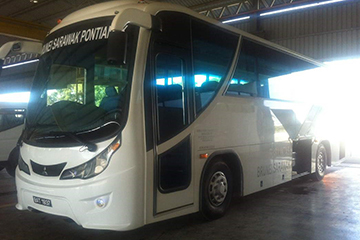 It specializes in bus route from Bandar Seri Begawan, Brunei to Pontianak, Kalimantan. 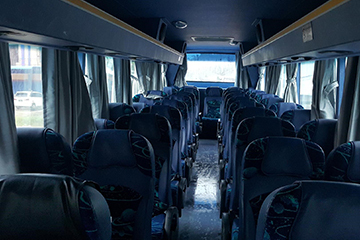 This long journey express bus company offers regular single deck buses with 30 seaters. 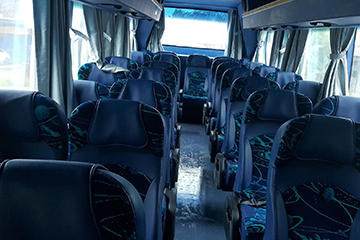 All the comfortable seats onboard come with ample leg room so the passenger can recline back and take a nap while enjoying the cooling ambience in the bus as they are head to Pontianak, Kalimantan from Bandar Seri Begawan. The buses are also installed with a TV to keep the passengers entertained during the long-haul bus journey. MHS Express bus company offers two pick-ups in a week from Bandar Seri Begawan to Pontianak, Kalimantan and you can check the available bus schedule available on Easybook. Check out the MHS Express bus schedule and price on our website to choose the bus that meets your travel plan in order to make your ticket purchase online. Travel time from Brunei to Kalimantan is approximately 20 hours depending on the road condition to cross the border from Brunei to Malaysia and followed by Indonesia. You will need to get down from the bus to queue at the immigration checkpoint, then followed by the Malaysia immigration checkpoint to enter Sarawak, Malaysia. Next, you need to alight from the bus to pass through Malaysia immigration checkpoint to enter Indonesia. All of the coach drivers are skillful and experienced to make sure passenger arrive at Pontianak, Kalimantan safely. Now you can book MHS Express bus ticket online from Easybook, which is the largest land and sea transport booking website in Southeast Asia. Easybook provides fast and secure online ticket purchase services to all travellers. Search for the available bus schedule of your choice and travel from Bandar Seri Begawan, Brunei to Pontianak, Kalimantan without hassle. The bus ticket online can be booked with just a few clicks. You can purchase the bus ticket on Easybook website or via Easybook mobile app which is available on both Google Playstore or Apple App Store. Right after you have selected your bus schedule and preferred seats on the bus, you will need to proceed to do online payment before receiving the order summary within 24 hours of the ticket purchase. Purchasing express bus ticket is so easy these days with Easybook.com.